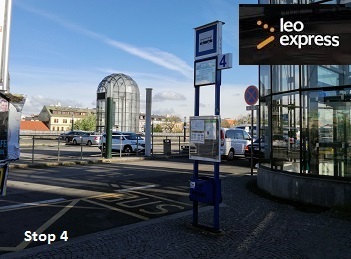 Bus companies that are using this stop: LEO Express a.s. The bus stop is next to the Vinci bus parking place at the Prague main railway station. The parking is located across the 4-lane highway street (Wilsonova) running in front of the station main building (Fanta's buil­ding). 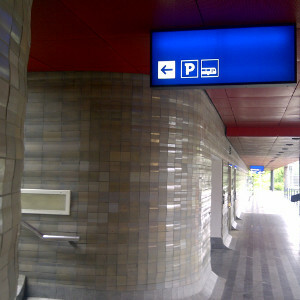 From the taxi stands in the station you can follow the bus parking signs – see the picture. 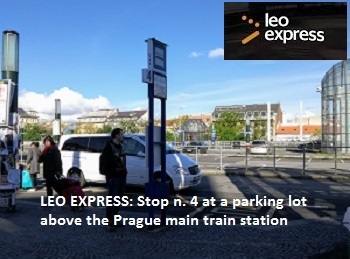 LEO Express buses to Budweis, Cesky Krumlov, Linz, Salzburg, Pilsen and Munich depart from the stop No. 4 at the parking lot. Stop 3 in front of the Fanta's building is used only for a bus to Dresden. LEO Express trains use the platform 1b. Look at the plan below with the logo of the carrier.